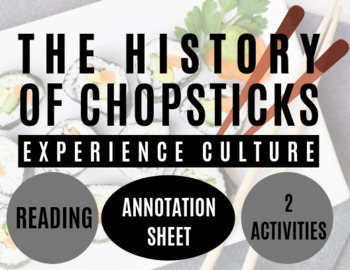 Whether it be in an ELA or Social Studies classroom, this activity that covers the history behind the ancient utensil of chopsticks will benefit all! Allow the provided teacher guide (with purchase) to explain the lesson as a whole! Students will be provided an informational reading that discusses the history and origin of chopsticks. Students can be provided the annotation sheet that is an easy guide for comprehension. Students can also answer the questions that are provided that accompany the reading and reinforce the material. A KEY IS INCLUDE! A cartoon or comic strip that can be done on paper or other technological tool(s) that depict the story of the history of chopsticks! Allow your students to have fun while experiencing culture!